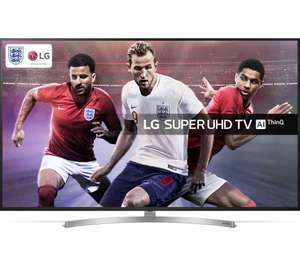 Currys have reduced this TV from £999 to £899 now. Comes with a 5 Year Guarantee. For the best possible picture, look no further than the LG 65SK8100PLA 65" Smart 4K Ultra HD HDR LED TV. It delivers outstanding picture quality to match even your local cinema. That's because 4K is up to four times the resolution of Full HD. It's much brighter, and has more detail. Thanks to 4K Cinema HDR, vibrant colours almost jump off the TV. Even dark colours are strong, which makes the 65SK8100PLA perfect for watching anything from gritty dramas, to colourful wildlife documentaries. HDR provides the widest palette of colours possible at the dark and light ends of the spectrum. That way you're guaranteed the most natural, realistic pictures that look true to life. Experience surround sound as you've never experienced before. Dolby Atmos is the next step in immersive audio. It projects sound in every direction, not just behind you, to create the illusion of three-dimensional sound that'll blow you away. You won't even need additional speakers to feel it. Just don't get too scared while watching horror films, when you'll feel as if something, or someone, is creeping up behind you. Don't worry if you arrive home too late to watch your favourite TV shows. LG's smart TV features have you covered. They include a wealth of entertainment and catch up TV apps such as Netflix 4K, BBC iPlayer, and lots more. It means you can download any shows you've missed, and watch them at any time. Even your favourite series and films from across the pond. With plenty to watch, you'll never be bored. You can even browse the internet, or check out the latest YouTube videos on the big screen. I always try and convince myself that these LGs are great value for money but as soon as I go see them in person the picture quality is always the worst in the store (apart from the oled ones) . Maybe they are not set up right but my visits consistently end up with me walking away from them and feel glad I didn't just order one without seeing it in person. I always try and convince myself that these LGs are great value for money …I always try and convince myself that these LGs are great value for money but as soon as I go see them in person the picture quality is always the worst in the store (apart from the oled ones) . Maybe they are not set up right but my visits consistently end up with me walking away from them and feel glad I didn't just order one without seeing it in person. LG tv's usually have low peak brightness compared to other brands, this makes them poor for shop display models where all the others are bright enough to burn your retinas but in home use the brightness is usually fine. Whether this particular tv is actually any good or not is another matter, all brands have their good and bad models. I have the 49" of this model and us generally very good. The only downside is the dimming which is noticeable on very dark scenes with one bright highlight. There is a vertical banding which is a bit annoying. Otherwise it's good and this is a good price OP. Still too expensive for me, I noticed when watching the last few episodes of GOT that they have a lot of very dark scenes in them and no doubt the new series will have too, be interesting to see what people think of these tvs then. I have the 49" of this model and us generally very good. The only downside …I have the 49" of this model and us generally very good. The only downside is the dimming which is noticeable on very dark scenes with one bright highlight. There is a vertical banding which is a bit annoying. Otherwise it's good and this is a good price OP. LG tv's usually have low peak brightness compared to other brands, this …LG tv's usually have low peak brightness compared to other brands, this makes them poor for shop display models where all the others are bright enough to burn your retinas but in home use the brightness is usually fine.Whether this particular tv is actually any good or not is another matter, all brands have their good and bad models. Poor black level and contrast performance owing to the IPS panel on an otherwise decent TV. 3D is dead but best bet is to look for old models. Last years Panasonic ( 2 years ago model) 58DX802B was the last good 3d TV. No longer made until no doubt 2020 when avatar 2 comes out which may create a newer 3d tech. Theres Still a Demand For 3D TV Oh Projector!